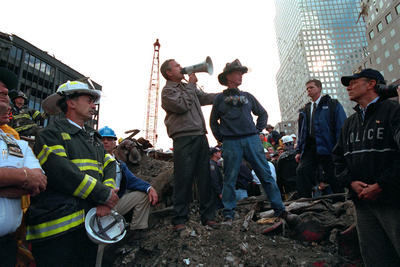 Standing on top of a crumpled fire truck with retired New York City firefighter Bob Beckwith, President George W. Bush rallies firefighters and rescue workers Friday, September 14, 2001, during an impromptu speech at the site of the collapsed World Trade Center towers. Ican hear you, President Bush said. The rest of the world hears you. And the people who knocked these buildings down will hear all of us soon. Made in USA.